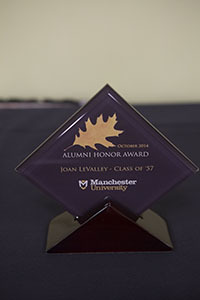 Two people on Oct. 10, 2014, received Alumni Association Honor Awards, the highest recognition the association can bestow on a living graduate of Manchester University. A Manchester tradition since 1960, this 125th anniversary year is the first time the awards were presented during Homecoming. The Alumni Honor banquet was 5 p.m. Friday, Oct. 10, in the Lahman Room of the Jo Young Switzer Center on the North Manchester campus. Joan LeValley, a nationally recognized accountant who graduated in 1957, has served as an accountant, tax preparer and IRS representative. The Park Ridge., Ill., woman has been named among the top 50 IRS Preparation Practitioners in the U.S. and was named Person of the Year by the Illinois Independent Accountant Association three times. Well known in the Chicago area among large law firms and tax attorneys for her IRS preparation work, she was named Accountant of the Year by the National Society of Accountants. Terry Pettit is a legendary woman’s volleyball coach who has returned to his MU English major roots to write two books and produce an instructional DVD. The 1968 graduate went on to get his master’s degree at the University of Arkansas. After several years of teaching, he adjusted that focus to volleyball, leading University of Nebraska teams to 18 Big Eight conference championships, three Big 12 conference championships and an NCAA national championship. In 23 years, his record was 694-148. The Fort Collins, Colo., resident spoke Oct. 9 at the University. 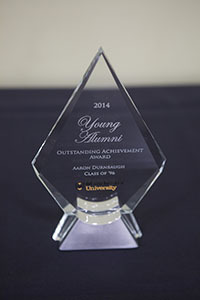 The Young Alumni Outstanding Achievement Award recognizes alumni between the ages of 31 and 40 who demonstrate outstanding leadership in their careers, contribute to the betterment of their communities, and retain a strong alliance with the University. The 2014 honoree is Aaron Durnbaugh, a member of the class of 1996. He is director of sustainability at Loyola University Chicago. As a LEED-accredited professional, he focuses on water protection, energy conservation and mission-driven sustainability action. From Elgin, Ill., he is vice chair of the Chicago Wilderness Alliance and is a member of the Vibrant Cities and Urban Forest Task Force. 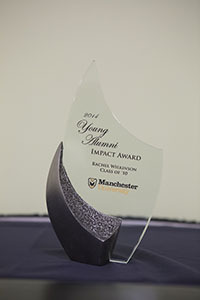 The Young Alumni Impact Award goes to Rachel Wilkinson, a member of the 2010 class. The Warsaw, Ind., resident is global marketing communications manager for Biomet and was recently awarded the company’s Titanium Award. 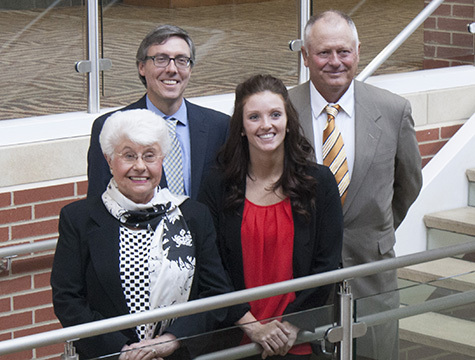 The North Manchester native serves as an alumni advocate for current Manchester students.